The prize for competition #1 went to Gillian Reid who has already received her 10 book prize. 1st prize in competition #2 goes to Kate Knight who will receive all 10 novels. To all winners, please PM me with the dedication you’d like (if any) and your postal address. Well done and thanks for playing! The paperback edition of The Half-Life of Hannah, published by Black and White Books, is released tomorrow and will be appearing in bookshops large and small around the country. There are 12 different prizes of #Loadsabooks to be won in the great #HalfLifeOfHannah giveaway, just a selection of which are shown in the photo here. 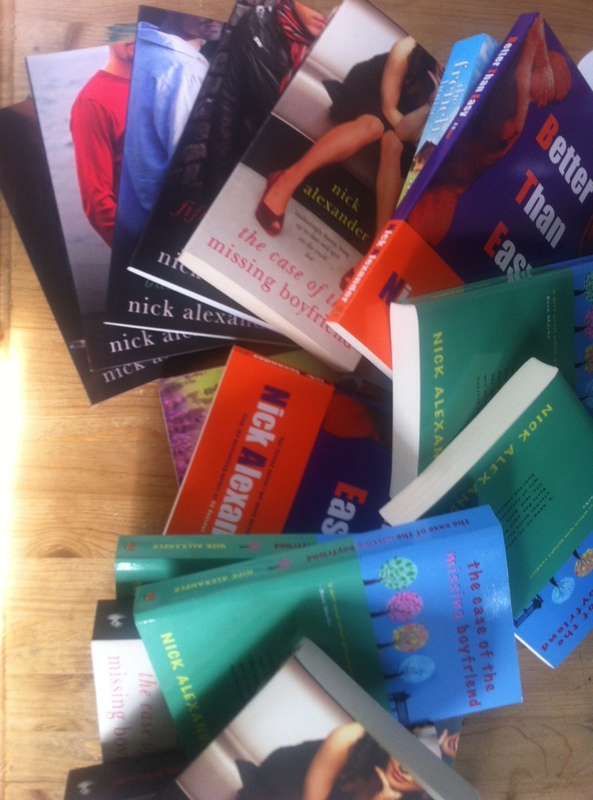 There are 4 different ways to win #Loadsabooks in the #HalfLifeOfHannah competition. Some of these are time critical (but guarantee a prize for the winner) and some of them aren’t but will depend, instead, on a prize draw at the closing date (31st May). Competition #1 (Time critical). One Prize – all 10 Novels. List value £99. Find a copy of The Half-Life of Hannah in a local bookstore. one of the bookstore frontage taken from the street so that the name of the bookstore is clearly visible. one of you pointing at the copy of Half-Life of Hannah in the window or on the bookshop shelf. Either post these two photos to my Facebook timeline (ie post them and tag me in them www.facebook.com/alexandernick – you’ll need to befriend me first) or tweet them to me (@authornick). Include the hashtags #HalfLifeOfHannah and #Loadsabooks in your post. The FIRST person to complete these stages is guaranteed to win signed, dedicated paperback copies of ALL of my novels. These comprise The Fifty Reasons Series (5 books), The Half-Life Of Hannah, Other Halves, The Case Of The Missing Boyfriend, The French House and 13:55 Eastern Standard Time. That’s over £98 worth of books. You are permitted to phone around bookstores to find a copy, and you’re even allowed to order a copy (though you’ll have to purchase it if you do). All subsequent (not 1st) entries to competition #1 received by the 31st May will be entered into a prize draw. The first name drawn will receive the same prize as competition #1, IE signed, dedicated copies of all ten of my novels. The second name drawn will receive signed copies of the Half-Life of Hannah plus The Case Of The Missing Boyfriend. The Third, Fourth and Fifth names drawn will receive rare, first edition copies of The Case Of The Missing Boyfriend and of Better Than Easy from the Fifty Reasons series. The competition may not be entered by the staff of Black & White Publishing, Corvus Books, the employees of bookshops or distributors stocking The Half-Life of Hannah the family or close personal friends of the author. All entries for the prize draw must be publicly posted to the author’s Facebook or twitter accounts as detailed above by midnight on the 31st of May.